Wizard Software offers custom integration between our solutions, your back-office systems, and other third-party software and IT security protocols. Our unique expertise working with many enterprise systems allows us to streamline the integration process, offer one-way or two-way data exchange, and provide nightly batch imports and exports, web services, and APIs. We also offer corporate network security integration through SAML, LDAP, ActiveDirectory, OAuth, Okta, and other custom configurations. Our Enterprise Simple Portal™ (ESP™) dramatically reduces the time it takes to connect Wizard Software solutions with your ERP system or database systems. 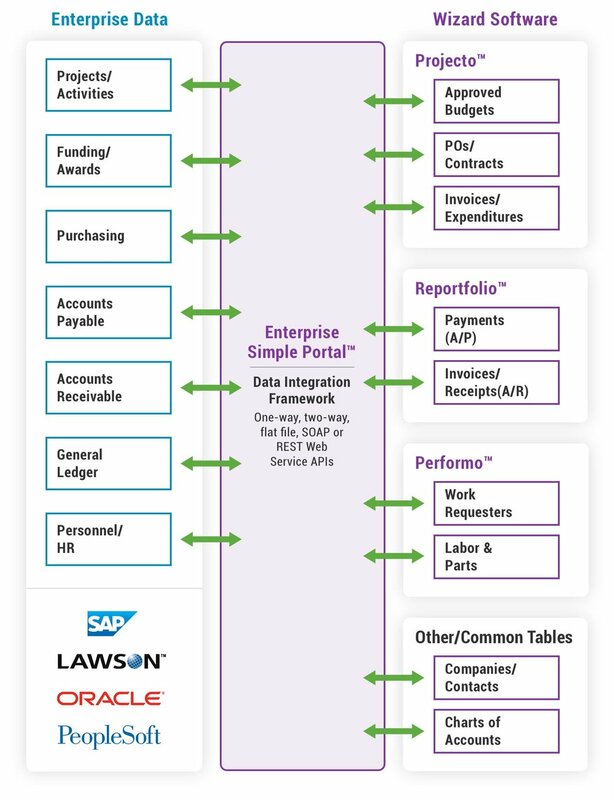 The Enterprise Simple Portal™ (ESP) is a software framework and API which is the foundation for integration between any Wizard Software solution and your enterprise data. ESP™ is designed to give Wizard Software programmers a head start to dramatically accelerate the time required to build a connection between your Wizard Software solution and your enterprise financial/ERP data from systems like Oracle, PeopleSoft, Lawson, and SAP. ESP™ also makes it easy for your data administrators to connect and build your own interfaces with Wizard Software application data. Each interface is programmed to meet your specifications, data validation rules, and data security protocols. One-way or two-way data transfer or synchronization available. Secure FTP batch file transfer or SQL direct connection to live data. Commonly used data transfer file formats include comma- or tab-separated text, fixed-character text, XML, MS Excel (.xls or .xlsx) or MS Access (.mdb). REST and SOAP Web Service integrations are also available. Project commitments — purchase requisitions, POs, contracts, change orders. Project expenditures — invoices, project expenses, inter-department charges. Project vendors and contact data. Project schedule phases and dates. Project documents, files, and photographs. Project labor recharge/reclass (Projecto™ Timecard module). Landlord and Tenants/Lessee account data. A/P payments — monthly or on demand to pay. A/R invoices — to be sent. Tenant/lessee insurance policies, coverages, and expiration dates. Allocation of payments and revenues by department or charge codes. Site/lease/agreement documents, files, and photographs. Work order requesters (personnel directory). Asset lifecycle repair and replacement — forecasted capital and operations costs. Work order costs — labor and parts. Daily log of all interface activities, file transfers, and record counts. Exception reports provide alerts to data validation errors. Automated email alerts for interface success and/or errors.